I had a strange day today schedule wise. Because of that, I had dinner at 2:00 in the afternoon, so at about 9:00 pm tonight, I heard my tummy growl a bit. I made a huge pork roast on Tuesday night and The Stud Muffin and I have been eating that for the last 4 nights. You can get several meals per roast which makes large roasts one of my more favorite things to buy, despite the initial sticker shock. I live about 4 miles from a quaint little red farmhouse that serves as the retail store for a local pig farm. So when I have a hankering for a nice roast, I go there. From a single roast we had two meals with roasted veggies and gravy, then some pulled BBQ pork sandwiches, using my Zesty BBQ Sauce, and tonight we had Real Food Pork Fried Rice and I still have just under half a roast left. I think I see Pork Pot Pies in our future. I’m not sure. What would you make with all that left over pork roast? 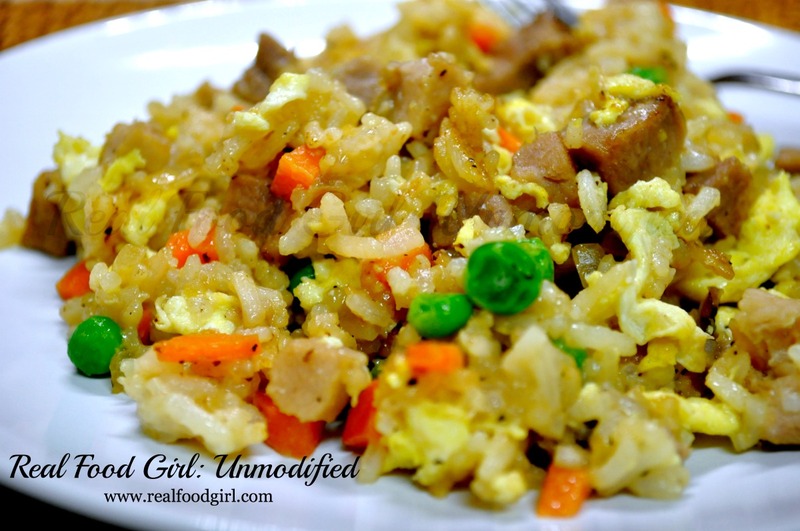 This dish turns out best if you’ve got some leftover rice in the fridge already. If you don’t, and you make your rice fresh, the dish will be notably sticky and heavy. It will still be tasty, but the texture will be much different. TSM likes it sticky and heavy, and I like it better if the rice was left over from a previous nights meal. This whips up pretty quickly. 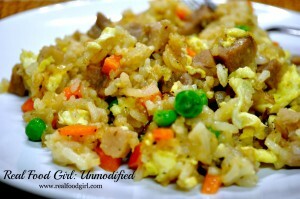 I think if people knew how easy it was to make Real Food Fried Rice, they’d make it more often. 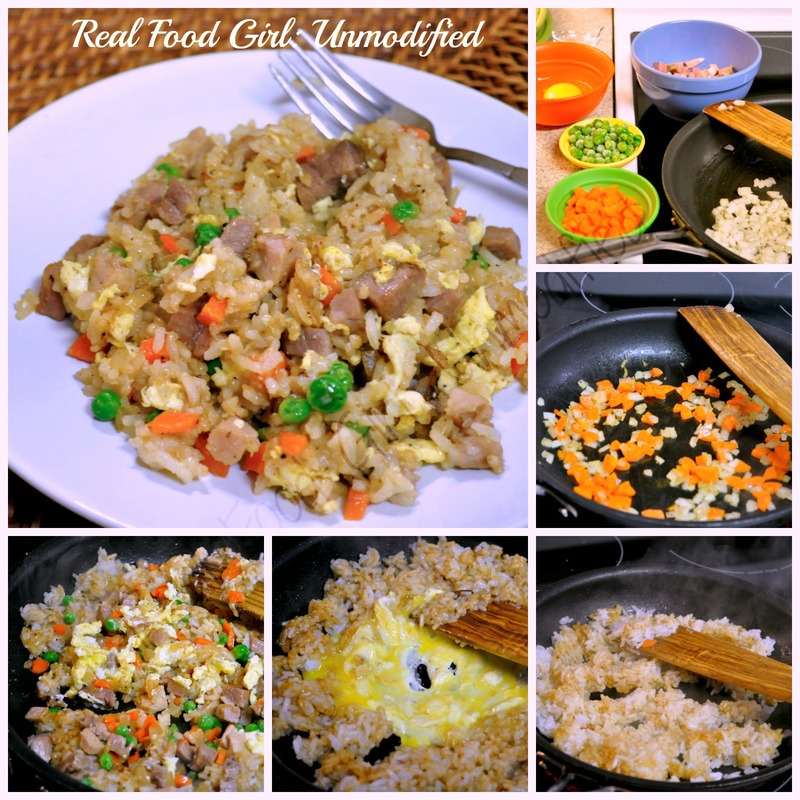 A quick and easy Real Food version of fried rice. In a medium skillet set over medium-low heat, melt clarified butter and add diced onion. Season with salt and pepper and cook until onion is soft, about 3 minutes. Add carrots and cook another 3 minutes. Season with a little salt and pepper and add diced pork and cook until warmed through. Remove mixture into a small bowl and set aside. Add 1 tsp. lard, coconut oil or more clarified butter to the skillet. 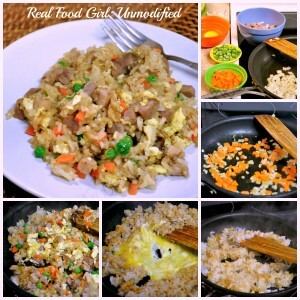 Increase heat to medium-high and add cooked rice. Cook and stir for 90 seconds. Add 2 tsp of soy sauce and stir to combine. I usually end up with about 2 TB of soy sauce. You might want more- you may want less. It's TT, which means To Taste. Continue to cook and stir rice for 2-3 minutes adding additional soy sauce as desired. Push the rice to the outside of the pan creating a "hole" in the middle. Add the beaten egg. Let it sit in the hot pan for 30 seconds before you start to stir it. Once it is 70% cooked, start mixing it in with the rice. Lower heat to medium-low and cook for another 60 seconds. Add the carrot-onion-pork mixture to the skillet and stir to combine. Add the peas and continue to cook rice until peas are warmed through about 90 seconds. Remove from heat, plate and enjoy. Feel free to add any type of fresh or frozen veggie that you want, as long as it doesn't have a high water content. We just happen to like the basic carrots, peas and onions. 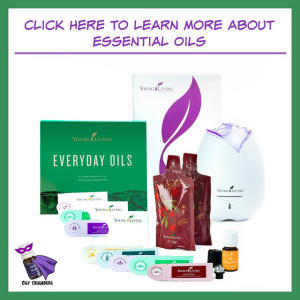 Sounds really good – look forward to trying this! Hey Beth! It was super tasty! Nice to “hear” from you again! !